For other uses, see Stock (disambiguation). "Fond" redirects here. For the archival term, see Fonds. For other uses, see Wiktionary:fond. Stock is a flavored liquid preparation. It forms the basis of many dishes, particularly soups, stews and sauces. Making stocks involves simmering animal bones or meat, seafood, or vegetables in water or wine, adding mirepoix or other aromatics for more flavor. Leftover cooked meat, such as that remaining on poultry carcasses, is often used along with the bones of the bird or joint. Fresh meat makes a superior stock, and cuts rich in connective tissue such as shin or shoulder of beef or veal are commonly recommended, either alone or added in lower proportions to the remains of cooked poultry, to provide a richer and fresher-tasting stock. Quantities recommended are in the ratio of 1 part fresh meat to 2 parts water. Pork, although a popular base for stock in Chinese cuisine, is considered unsuitable for stock in European cooking due to its greasiness(although 19th-century recipes for consomme and traditional aspic included slices of mild ham), and mutton was traditionally avoided due to the difficulty of avoiding the strong tallowy taint imparted from the fat. Veal, beef, and chicken bones are most commonly used. The flavour of the stock comes from the cartilage and other connective tissue, like the bone. Connective tissue has collagen in it, which gets converted into gelatin that thickens the liquid. Stock made from bones needs to be simmered for longer than stock made from meat. Pressure cooking methods shorten the time necessary to extract the flavour from the bones. Mirepoix is a combination of onions, carrots, celery, and sometimes other vegetables. Often, the less desirable parts of the vegetables that may not otherwise be eaten (such as carrot skins and celery cores and leaves) are used. The use of these parts is highly dependent upon the chef, as many do not appreciate the flavours that these portions impart. The herbs and spices used depend on availability and local traditions. In classical cuisine, the use of a bouquet garni (or bag of herbs) consisting of parsley, bay leaves, a sprig of thyme, and possibly other herbs, is common. This is often placed in a sachet to make it easier to remove once the stock is cooked. Many cooks and food writers use the terms broth and stock interchangeably. In 1974, James Beard wrote emphatically that stock, broth, and bouillon "are all the same thing". While many draw a distinction between stock and broth, the details of the distinction often differ. One possibility is that stocks are made primarily from animal bones, as opposed to meat, and therefore contain more gelatin, giving them a thicker texture. Another distinction that is sometimes made is that stock is cooked longer than broth and therefore has a more intense flavor. A third possible distinction is that stock is left unseasoned for use in other recipes, while broth is salted and otherwise seasoned and can be eaten alone. In Britain, "broth" can refer to a soup which includes solid pieces of meat, fish, or vegetables, whereas "stock" would refer to the purely liquid base. Traditionally, according to this definition, broth contained some form of meat or fish; however, nowadays it is acceptable to refer to a strictly vegetable soup as a broth. Bouillon (UK: /ˈbuːjɒ̃, ˈbwiː-/, US: /ˈbʊljɒn/; French: [bujɔ̃]) is the French word for "broth", and is usually used as a synonym for it. 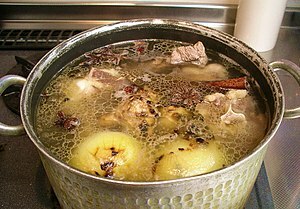 Chicken stock is usually cooked for 6 to 8 hours if the traditional method is followed. Fish stock is made with fish bones and finely chopped mirepoix. Fish stock should be cooked for 20–25 minutes—cooking any longer spoils the flavour. Concentrated fish stock is called "fish fumet." In Japanese cooking, a fish and kelp stock called dashi is made by briefly (a few minutes) cooking skipjack tuna (bonito) flakes called katsuobushi in nearly boiling water. Fond blanc, or white stock, is made by using raw bones and white mirepoix. Chicken bones are the most common for fond blanc. Fond brun, or brown stock. The brown color is achieved by roasting the bones and mirepoix. This also adds a rich, full flavour. Veal bones are the most common type used in a fond brun. Tomato paste is often added (sometimes thinned tomato paste is painted onto the roasting bones). The acid in the paste helps break down the connective tissue helping accelerating the formation of gelatin, as well as giving color to the stock. Glace viande is stock made from bones, usually from veal, that is highly concentrated by reduction. Ham stock, common in Cajun cooking, is made from ham hocks. Jus is a rich, lightly reduced stock used as a sauce for roasted meats. Many of these are started by deglazing the roasting pan, then reducing to achieve the rich flavour desired. Lamb stock is cooked for several hours. To make a lamb jus, start with a chicken stock and roasted lamb necks and bones. Master stock is a special Chinese stock used primarily for poaching meats, flavoured with soy sauce, sugar, ginger, garlic, and other aromatics. Prawn stock is made from boiling prawn shells. It is used in Southeast Asian dishes such as laksa. Veal stock is usually cooked for several hours. Vegetable stock is made only of vegetables. Remouillage is a second stock made from the same set of bones. The stock ingredients are simmered starting with cold water. The collagen from connective tissue and skin is denatured into gelatin through gentle, long simmering, thickening the stock somewhat. Salt is usually not added or only minimally added to the stock, since most stocks are reduced to make stews and sauces, and excessive salt will make the final dish too salty. Meat is added to a stock before vegetables, and the "scum" that rises to the surface is skimmed off before further ingredients are added. If the cook wants to remove the fat, after the stock is finished it is cooled and the fat, which floats, separates and solidifies into globs within the stock, which can be removed with ease. The refrigerator shelf life of a stock is three to four days, but the stock can be boiled at the end of this period and the life extended another three to four days. Stock can be kept for extended periods in this manner. Escoffier, Auguste (1903). Le Guide culinaire. Aide mémoire de cuisine pratique. Paris, France: Flammarion. Escoffier, A (1941). The Escoffier Cook Book. New York, NY, USA: Crown Publishers. Fannie Merritt Farmer (1896). The Boston Cooking-School Cook Book. Boston, MA, USA: Little, Brown and Company. Beck, Simone; Louisette Bertholle; Julia Child (1961). Mastering the Art of French Cooking. New York, NY, USA: Alfred A. Knopf. ^ a b Wright, Clifford A. (2011). The Best Soups in the World. Houghton Mifflin Harcourt. ISBN 0544177797. I use the terms 'broth' and 'stock' interchangeably, as do many people, although technically there is a very small difference—not important to the home cook....Some English-speaking writers make a distinction between broth and bouillon, but bouillon is simply the French word for broth. ^ López-Alt, J. Kenji. "How To Make Great Vegan Soups". Serious Eats. Retrieved 2016-11-29. I don't really want to get into the muddy details of nomenclature between broth and stock...I use the words pretty much interchangeably, though I lean towards 'stock' if I mean something pretty rich that I'm gonna cook with and 'broth' if I mean something my noodles or peas are already floating in. ^ a b Souder, Amy (April 10, 2016). "What's the Difference Between Chicken Stock and Chicken Broth?". Chowhound. Retrieved 2016-11-29. Professional chefs and experienced cooks like us spout the broth and stock terms interchangeably. ^ Landis, Denise (19 November 2012). "'What's the difference between stock and broth, and which do I use for dressing and gravy?'". The New York Times. Retrieved 19 July 2018. Stock and broth are more or less the same thing, a mixture of any combination of meats (including poultry or seafood), bones, vegetables or herbs simmered in a large quantity of water, then strained. ^ Beard, James (2015). "A stock is a broth is a bouillon". The Armchair James Beard. Open Road Media. ISBN 9781504004558. The other morning my old friend Helen McCully called me at an early hour and said, 'Now that you're revising your fish book, for heaven's sake, define the difference between a stock, a broth and a bouillon. No book does.' The reason no book does is that they are all the same thing. A stock, which is also a broth or a bouillon, is basically some meat, game, poultry, or fish simmered in water with bones, seasonings, and vegetables. ^ "Broth Basics". Martha Stewart. 2011-05-17. Retrieved 2016-11-30. ^ Christensen, Emma. "What's the Difference Between Stock and Broth? — Word of Mouth". The Kitchn. Retrieved 2016-11-30. ^ a b Davidson, Alan (2014). The Oxford Companion to Food (3rd ed.). Oxford University Press. p. 112. ISBN 9780191040726. broth: a term which usually means the liquid in which meat has been cooked or a simple soup based thereon. It is a close equivalent to the French bouillon and the Italian brodo....It could be said that broth occupies an intermediate position between stock and soup. A broth...can be eaten as is, whereas a stock...would normally be consumed only as an ingredient in something more complex. ^ Spaull, Susan; Lucinda Bruce-Gardyne (2003). Leith's Techniques Bible. London: Bloomsbury. p. 661. ISBN 0-7475-6046-3. ^ Spaull, Susan; Lucinda Bruce-Gardyne (2003). Leith's Techniques Bible. Bloomsbury Publishing Plc, 38 Soho Square, London W1D 3 HB: Bloomsbury. p. 683. ISBN 0-7475-6046-3. ^ Smith, Delia (1992). Delia Smith's Complete Cookery Course. BBC Enterprises Ltd., Woodlands, 80 Wood Lane, London W12 0TT: BBC Books. p. 61. ISBN 0-563-36286-3. ^ Wells, John C. Longman Pronunciation Dictionary. Pearson Education ESL. ISBN 978-1405881180.